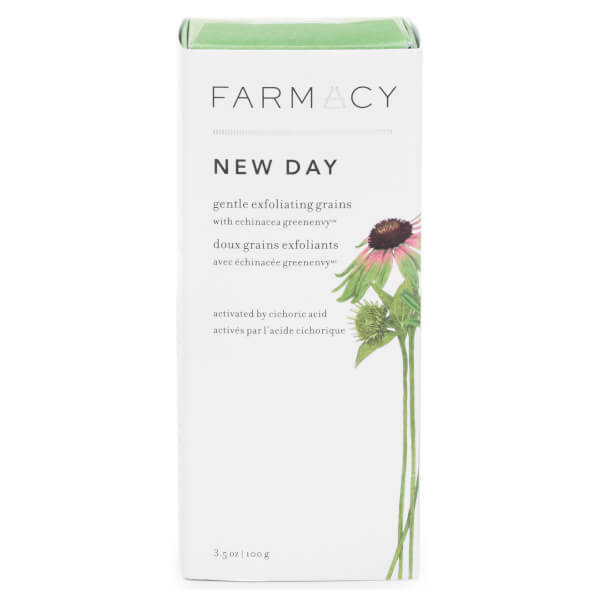 Clarify your complexion with the New Day Gentle Exfoliating Grains from FARMACY, a New York-based brand that combines innovative science with clean, locally grown ingredients to deliver farm-to-face skincare with effective results. 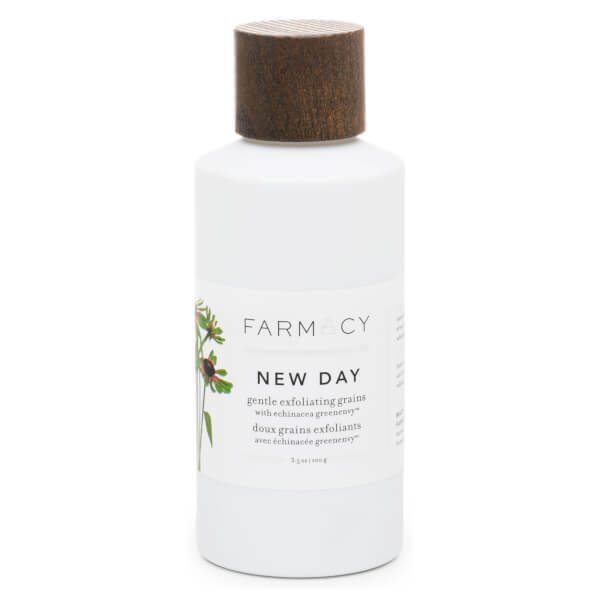 Harnessing the powers of Rice Bran Powder, Cranberry Seeds and White Willow Bark, the fine grains transform into a foaming and exfoliating cream when activated with just a few drops of water; they buff away dirt and impurities, whilst minimising excess oil and clearing the skin, without stripping or drying. Marshmallow and Green Tea work in tandem to soothe and protect skin, as Echinacea GreenEnvy™ (the brand's patented and exclusive plant) promotes a smooth, even tone and texture. Suitable for all skin types, the grains can also be used on dry areas, such as the elbows and knees. Perfect for refreshing and cleansing skin on-the-go. Free from parabens, phthalates, mineral oil and synthetic fragrance. Pour a small amount of the grains (about the size of a quarter) into your palm and add a few drops of water. Mix until a smooth, foaming paste forms, then gently massage onto skin using sweeping circular motions. Rinse with tepid water and pat dry. Sodium Cocoyl Isethionate, Zea Mays (Corn) Starch, Sodium Bicarbonate, Sodium Lauroyl Glutamate, Vaccinium Macrocarpon (Cranberry) Seed Powder, Citric Acid, Water/Aqua/Eau, Mannan, Phaseolus Angularis (Adzuki) Seed Powder, Spirulina Plantensis Powder, Echinacea Purpurea Root Extract, P-Anisic Acid, Salix Alba (Willow) Bark Extract, Ascorbic Acid, Tetrahexyldecyl Ascorbate, Glycerin, Butylene Glycol, Lactobacillus/Lemon Peel Ferment Extract, Camellia Oleifera Leaf Extract, Daucus Carota Sativa (Carrot) Root Extract, Althaea Officinalis Root Extract.